The sun is still shining!! 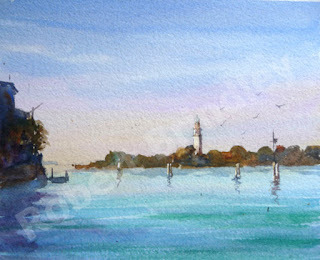 Just a half day's painting today, so we stayed on the Lido & painted the view towards the island of San Lazzaro. Because of it's location, this small island was an ideal place for a leper colony from the twelfth to the sixteenth century. In 1717 it was given by the ruling council of Venice to a group of Armenian monks.These eighteen monks built a monastery, restored the old church, and enlarged the island to about four times the original size! Fingers crossed for another good day tomorrow.......or is that being greedy? !